As we promissed some prints from the game starring the new summoner char. The summoner has some pretty impressive skills: drain life, sleep etc witch reminds us of Lineage 2. We didn’t liked one of her skill with sort of a death phantom… pretty creepy, but the rest are spectacular. We’ll talk about summoner skills in the next posts. Till then Enjoy the prints! 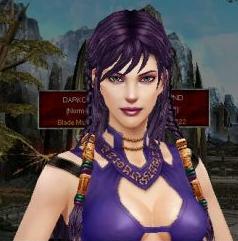 We entered out of curiosity on a MU Online server who just lauched Season 3… and surprise… a new char: Summoner. What can we say… she IS a female BUT she walks like a man or like a zombie (depends how you look at it), she has deep purple hair (omg I think the stylist mess the colour mix) and she carries a stick instead of staff or some other kind of weapon. Ohh I almost forgot… she has the most beautifull wings from the game (honestly :D). The wings we talk about are those from the image on the header. Purple of course but good looking. In the next post we’ll show you some prints of it. Till then, stay tuned!